The figure above shows the number of international retailers debuting in each city in 2018, with Toronto ranked 7th overall. Toronto is also the only North American city to appear in the top 20. The city has also ranked as one of the top 10 cities for attracting international retailers since 2016 (CBRE 2018). Many international retailers hoping to enter the North American market are choosing Toronto as their starting location due to several motivating factors. First, Toronto’s unique demographic appeals to a wide variety of retailers. The multicultural city consists of people from all over the world; each with different preferences. The diversity Toronto offers assures retailers that they can successfully emerge into the market and locate their target demographic. Second, retailers are shifting towards considering the U.S. and Canadian market as one. Previously, retailers would typically prefer expanding to the U.S. prior to Canada, however, now, many believe that Toronto can provide them with a solid start to their North American expansion plans. Retailers are beginning to view Toronto as “a global gateway city” (CBRE 2018). Furthermore, although Toronto is North America’s third-largest city, the cost of renting commercial spaces is less than half of many metropolitan cities in the U.S. For example, the cost of renting space on Toronto’s Bloor street is around $335 CAD per square foot (CBRE 2018), a tiny fraction of the cost to lease space on New York’s fifth avenue; which costs around $3,125 CAD per square foot (CNBC 2016). The lower leasing costs attract smaller or newer international retailers that may just be looking to test out the North American market. 14 out of the 40 new retailers chose to debut at Yorkdale Mall – one of Canada’s premier shopping malls. Yorkdale Mall is often a top choice for many retailers’ flagship Canadian store due to the fact that it has revolutionized its image into a luxury shopping destination. Yorkdale has undergone three major expansions in the recent past and is planning yet another expansion for the near future. The main purpose of the expansions is to attract increased amounts of international retailers, as well as to continue creating a positive economic impact for the surrounding area and Toronto as a whole. Yorkdale has a vision to change the landscape of Dufferin, which they plan to achieve by transforming the area into an improved urban space. This will also include new residential or office buildings. Through the construction of new buildings and expansion, it increases the flexibility of how the space can be utilized (Yorkdale 2016). Similarly, a smaller mall located on the corner of Bayview and Sheppard – Bayview Village Shopping Centre – also has ambitious plans for the future. Currently, Bayview Village prides itself in seeking high-end independent boutiques in order to create a brand distinct from any other shopping mall in Toronto. Their target market consists primarily of affluent shoppers residing in nearby neighborhoods, such as York Mills, Willowdale and Lawrence Park. In 2017, new owners of the shopping center put forward a proposal for the construction of five new buildings in the current outdoor parking lot. The new buildings will consist of over 1000 residential units, as well as an expansion of the pre-existing mall (blogTO 2017). The image above shows some of the proposed changes to the mall. Changes will include new apartment complexes, additional mall space and a new entrance to the Bayview subway station, just to name a few. 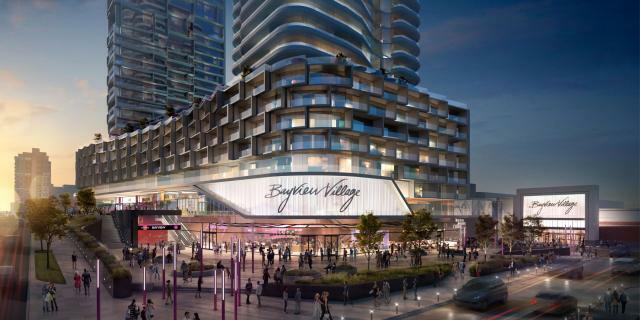 The purpose of the Bayview Village redevelopment is to transform the space into a more modern, urban and social space, similar to Yorkdale’s plans for the Dufferin area. Despite the difference in each shopping centre’s target market, the vision they have for the future are similar in the way that they both have plans to reshape Toronto’s retail market, contribute positively to the economy and provide residents with innovative spaces. This will undoubtedly continue to attract more international retailers as Toronto takes a solid first step into the future.